IN MEMORY OF YOUR LOVED ONE YOU CAN HAVE THE ASHES FOREVER ENCASED IN GLASS. 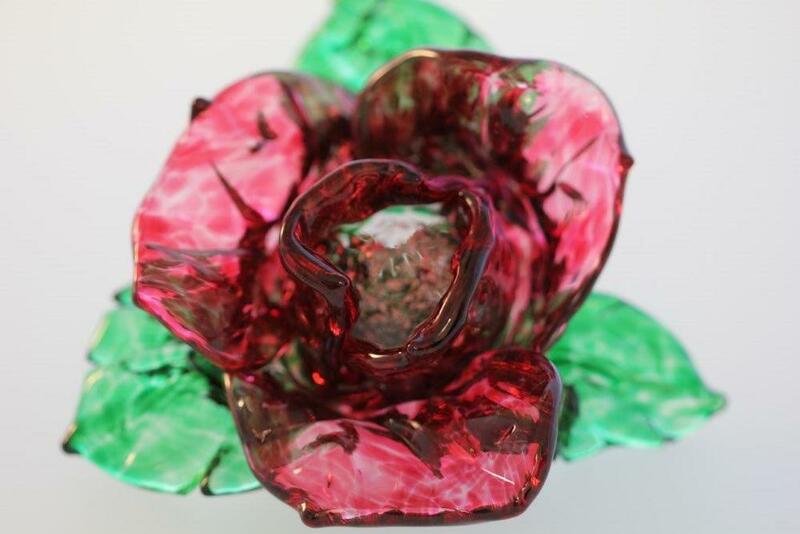 USING ONLY A SMALL AMOUNT OF ASH, FIREWEED GLASS ARTISTS WILL CREATE A BEAUTIFUL WORK OF ART FOR YOUR HOME OR CRYPT DISPLAY CASE. THESE EXQUISITE PIECES ALSO MAKE WONDERFUL GIFTS FOR FAMILY, FRIENDS AND CARE PROVIDERS. Hot sculpted glass. Available with one bird or two birds. Aprox. 5-1/4" high. Hot sculpted glass. Aprox. 3" diamter. Blown Glass scotch glass. Aprox. 3" high. Lampworked heart bead pendant and sterling silver. Pale Pink. 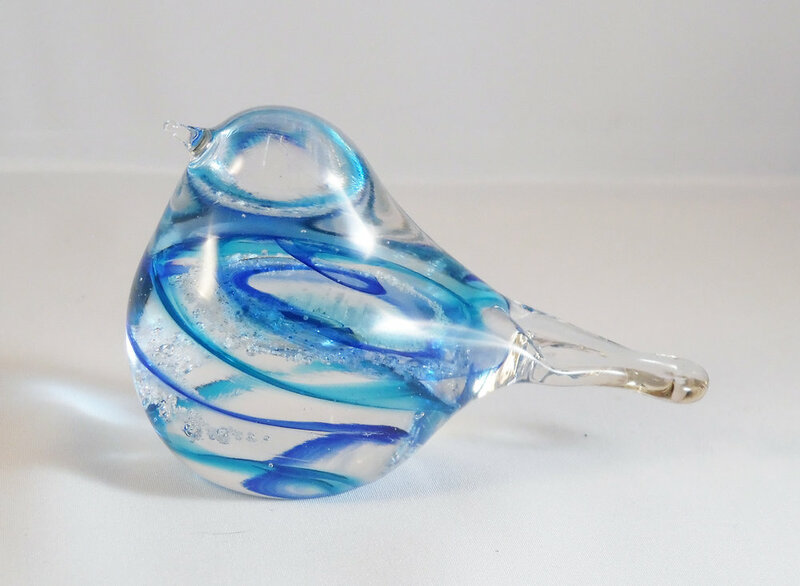 Lampworked glass bead bird pendant and sterling silver. Sterling silver chain included. Hot sculpted glass. Aprox. 4" high. Lampworked heart bead pendant and sterling silver. Pale Aqua. Hot sculpted glass. Made by Nicole Tremblay. Starting at 10-1/2" high. Lampworked heart bead pendant and sterling silver. Black. Lampworked heart bead pendant and sterling silver. Light Blue. Lampworked heart bead pendant and sterling silver. Clear. Lampworked glass and sterling silver. Available with 5mm, 4mm, and 3mm hole. Bracelet or necklace not included. Lampworked heart bead pendant and sterling silver. Light Green. Lampworked heart bead pendant and sterling silver. Light Purple. Hot sculpted glass. Avialable with one or two birds. Aprox. 5-1/4" high. Solid glass suncatcher ornament. May be hung inside or outside. Aprox. 3"high. Shown in Black. Clear or with a swirl of colour. Aprox. 2-1/2" diameter. Shown in White. Available in any colour of the rainbow. Aprox 2-1/2" diamter. Hot sculpted glass. Aprox. 3-1/2" long. Shown in Cobalt and Green. Hot sculpted glass. Made by Nicole Tremblay. Starting at 5-1/2" high. Aprox. 2-1/2" diameter. Shown in Violet. Aprox. 5" long. Shown in Clear. Hover over image for title and description. With a few exceptions, the whole rainbow of colours is available. 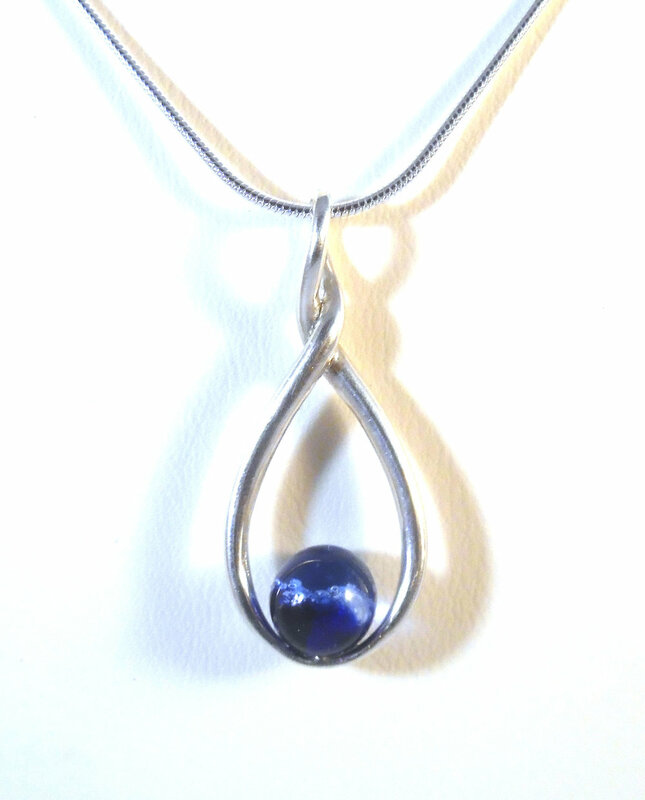 We can match a birthstone or a favorite colour. 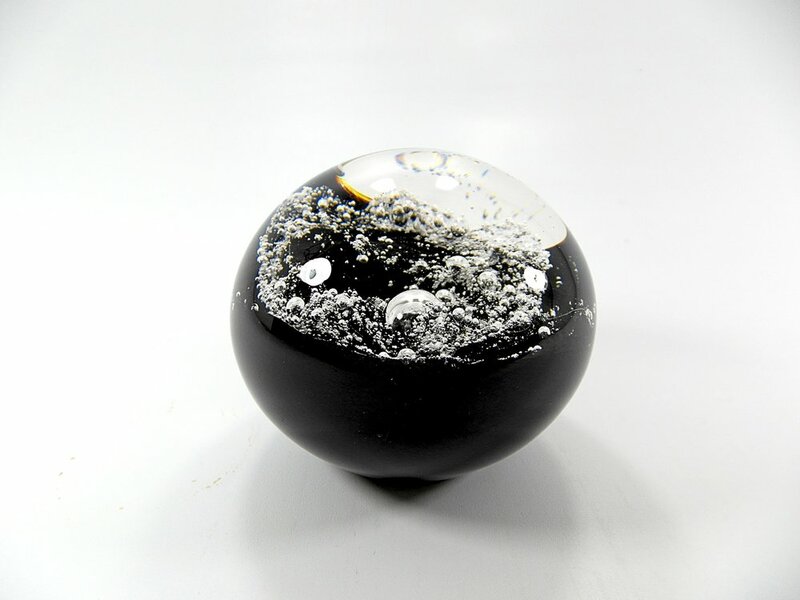 Ashes in clear glass have a serene beauty in their simplicity. EACH PIECE IS MADE ONE BY ONE BY HAND. AS SUCH, EACH PIECE WILL BE UNIQUE, SIZES LISTED ARE APPROXIMATE AND MAY VARY WITHIN AN ORDER. There are three ways to place your order. 1) You may email us your order and we will email you an invoice which you can pay securely online with your credit card or you may request a different method of payment. 2) You may drop your ashes off to us and place your order in person. We are open daily 11am to 4pm. 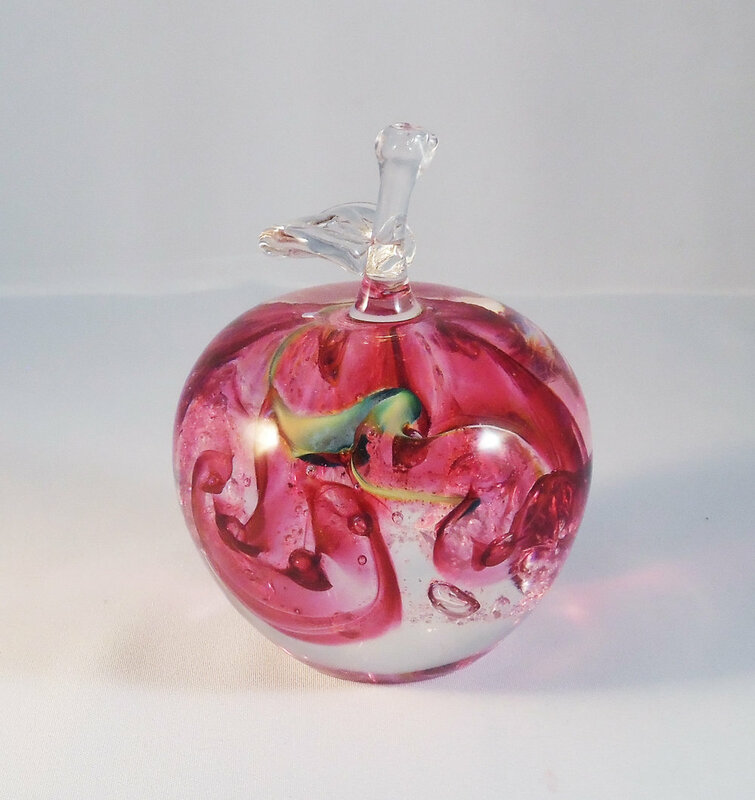 As Fireweed is a working glassblowing studio and the glass blower is often the only person working, in order for us to provide you with the best experience we do ask that you make an appointment to drop off and pick up your order. This will allow us to plan to give you the attention you deserve. Work on your order will commence once both full payment and the ashes have been received. Please allow 4-6 weeks for jewelry only orders and 12-14 weeks for orders that include hot sculpted items. (Regular turnaround times of around 8 weeks will resume in June). Please contact us if you have any questions regarding completion times. Once we have started working on your order we are unable to provide a refund if you choose to cancel. If we are mailing you your order, you will receive confirmation by email with a tracking number. 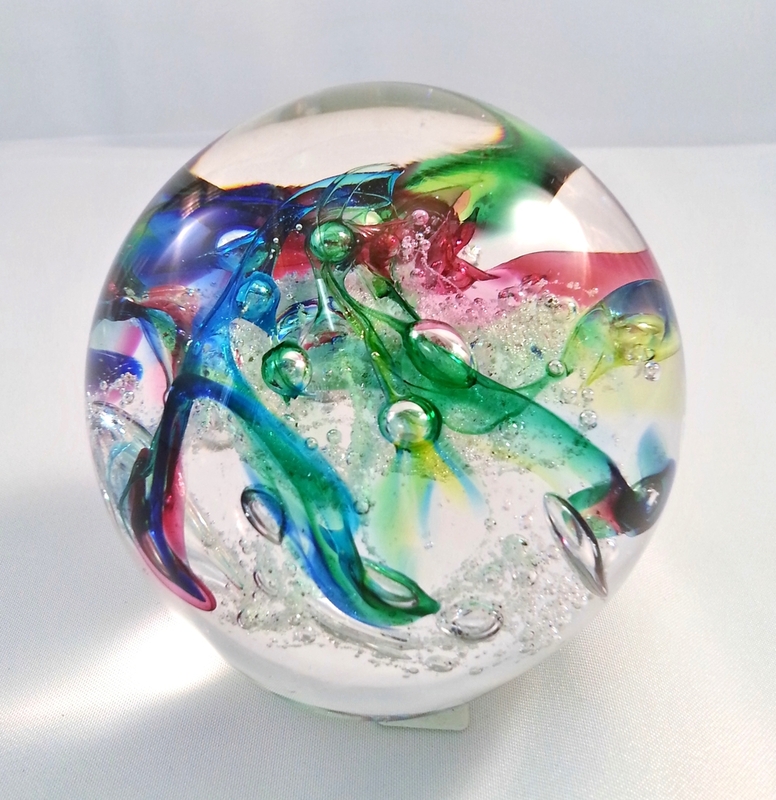 Please contact Fireweed Glass Studio for a complete list of images and prices or click HERE. Vine Urn. Blue/Gold. Vessel is 5" high, 5-1/2" diameter. Dawn Sky urn with birds. Violet/Cranberry. Vessel is 7" high, 4-1/2" diameter.